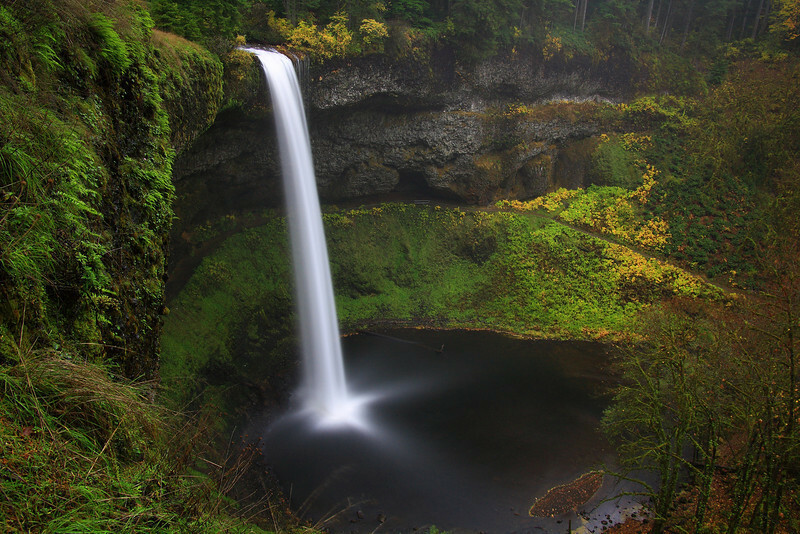 The South Falls at Silver Falls State Park is the second highest in the park with a height of 177’ ft. In 1928, northwest daredevil, Al Faussett attracted 2,000 people and charged them 50 cents a head to watch him plunge over the falls without a helmet or life jacket in a canoe. He survived but had to be hospitalized.This was taken from The Trail of Ten Falls. Stunning...love that perfectly smooth fall of water into the pool! Wonderful shot! I love the water and the POV. This is an outstanding image. The composition, colors & the perfect spill of the falls. Very hard to do with a long exposure without blowing out the highlights. A jaw dropper for sure!